July 21, 2017, 10:54 a.m.
After senior ministers engaged in a furious briefing war against one another in the wake of the general election result, Theresa May was forced this week to demand Tory MPs stop backbiting or risk Jeremy Corbyn coming to power. New YouGov data shows this state of affairs has not gone unnoticed by the general public. 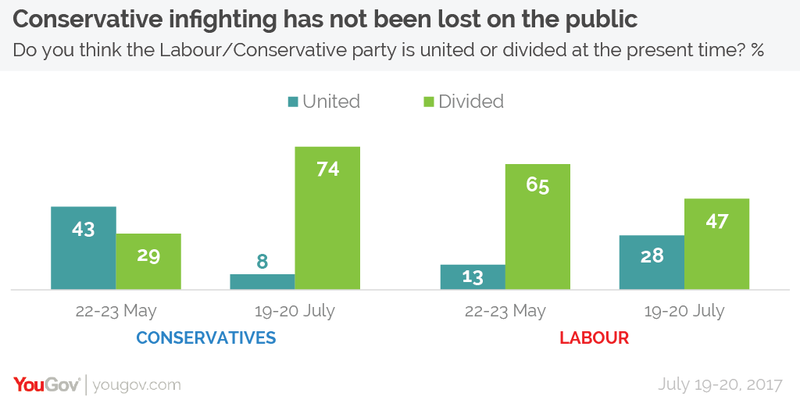 In late May, the public was more likely to see the Conservative party as united than divided (42% vs 29%). However, now just 8% see the party as united while almost three quarters (74%) think it is divided. Over the same period the public believe Labour has become more unified (although is still seen as more divided than united). The proportion that sees the party as united has risen from 13% in May to 28% now, while the proportion seeing Labour as divided has fallen from 65% to 47%. As is always the way with these things, the parties’ own supporters take a rosier view than the general public as a whole. More than half of Labour voters (54%) believe the party to be united, while 15% of Conservative voters say the same about the Tories.